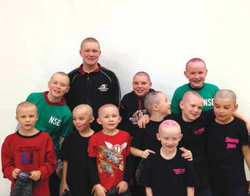 Ten students from New Sarepta Elementary School and one from NSCHS, shaved their heads to raise money for the fight against cancer at their school’s Valentine assembly on Friday, February 13th. The boys had their pink locks sheared as teachers, classmates, and parents cheered them on, for what has become an annual school event. Combined, the boys raised over $4000 for Alberta’s Hair Massacure fundraiser which supports children with life-threatening illness. A proud moment for NSE indeed! Pictured: Warriors for the cause – Back Row (left to right): Ty Preston, Chase Preston, Ashton Perry, Kadin Murch. Middle Row: Cody Preston, Carter Sagert, J.T. Preston, Atlee Helsby, Wyatt Knight, Kale Sagert. Front Row: Nash Helsby. Photo submitted. See another event photo in this week’s paper.